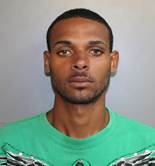 FREDERIKSTED — The Virgin Islands police Department is asking for your assistance in locating a 24-year-old St. Croix man who is wanted for questioning in connection with a domestic violence and property damage incident. He is approximately 5-feet,11-inches tall, weighs 140 pounds, has hazel eyes, dark brown hair and has a light complexion with tattoos between his left thumb and index finger; with tattoo of the word “GAZA” on the back of his right hand. Martinez is known to frequent the Bethlehem Village and Mutual Homes areas on St. Croix. OTHER INFO: If located call 911 or 340-778-2211. Please make contact with Det. G. Charlery (340) 712-6026 @ the Criminal Investigation Bureau Domestic Violence Unit.